iP3: iPad to send Windows into negative growth for the first time ever? iPad to send Windows into negative growth for the first time ever? 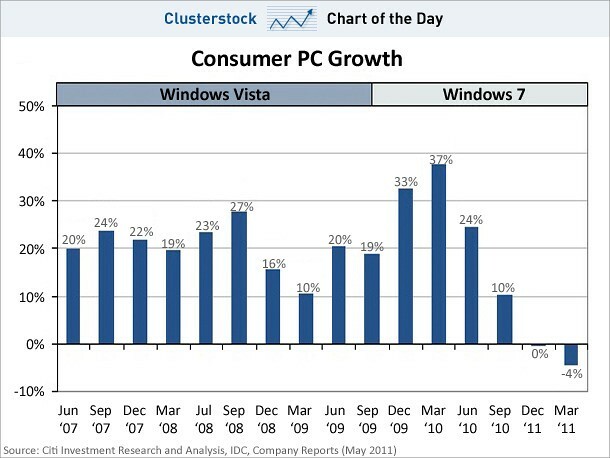 Microsoft’s consumer PC sales growth has pretty much never declined. Not even when Microsoft released Vista. Not even when the economy went in the toilet. But suddenly, the growth of sales is about to go negative, says Citi analyst Walter Pritchard. If Windows starts to decline in numbers, Microsoft CEO Steve Ballmer might actually be in trouble. If things weren’t bad enough, Microsoft also has to contend with a ChromeOS from Google and maybe even some ARM powered laptops from Apple. This is why Microsoft is giving away xbox360 with any windows 7 pc purchase of $699.99 or more, more details here.